Using cauliflower as a substitute is one of my tried and true tricks when I’m trying to lay back on the carbs. All of the recipes that I’ve experimented with are so good (…mashed cauliflower, buffalo cauliflower wings, cauliflower fried rice). Have you ever tried to make a homemade cauliflower pizza crust from scratch though? It’s TRULY painful and never ends up as crunchy as I’d like it to be. Plus, I really don’t have time for all of that. Let me start off by saying that this post is by no means sponsored. Let me also start off my saying that I nearly harassed the Trader Joe’s via telephone in order to find out when they’d be getting these frozen crusts in stock. Apparently they were a hot item at first and would sell out pretty much immediately. I don’t seem to have a problem getting my hands on them nowadays though. Thank god. LOL. 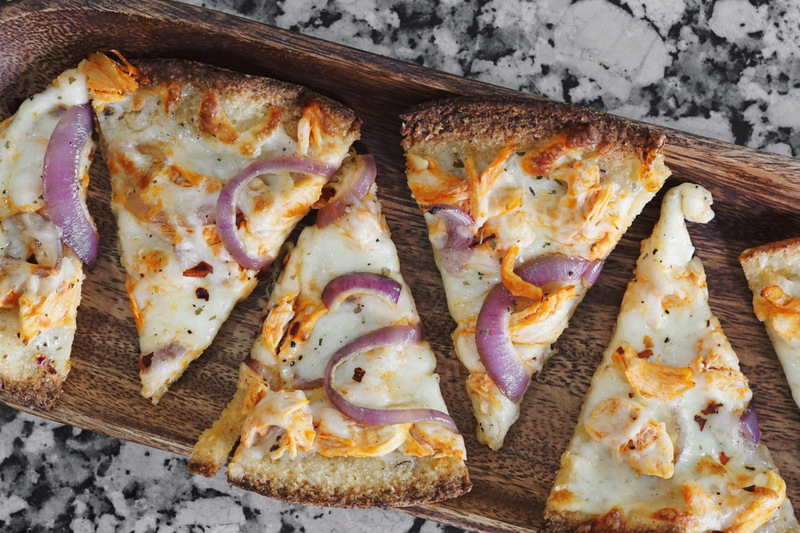 I posted this Buffalo Chicken Pizza on my Insta Story a couple of weeks ago and you guys were dying for me to share the recipe. You have to try it for yourself and let me know how it is! We loved it! You can also top these crusts with just about anything — I’ve done anything from a white pizza with garlic, cheese, and spinach to a standard pepperoni pizza. Bake the crust without toppings according to directions on the box. Cook the chicken (I chose to boil mine – I find it shreds better this way). Toss shredded chicken in hot sauce in a small bowl. Caramelize the red onions in olive oil in the meantime too. 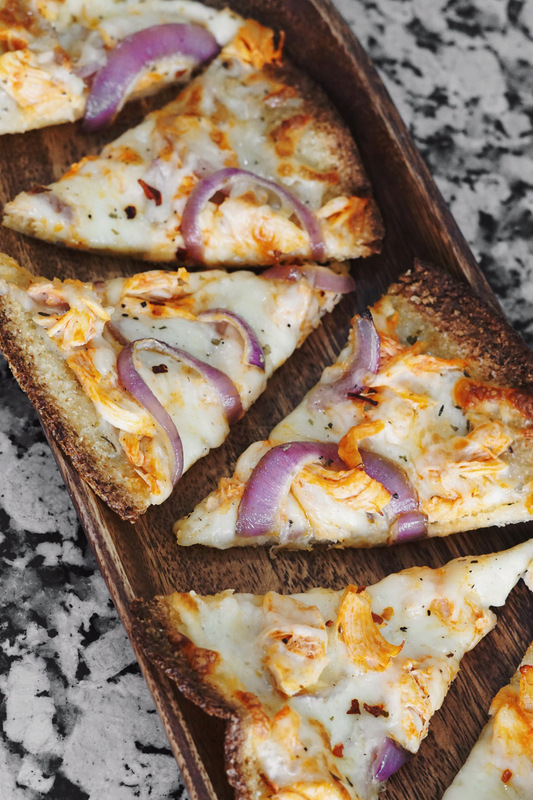 Once the crust is crisp, top with ranch, chicken mixture, caramelized onions, and cheese. Bake at 425 deg until cheese is melted. I’m totally trying this recipe out! I obsess over Trader Joe’s recipes and I love using cauliflower for everything! Thanks for posting this.. Can’t wait to try!